عبدی, رضا, یاسی, مهدی, صدقی, حسین. (1394). ارزیابی روش‌های اکولوژیکی- هیدرولیکی- هیدرولوژیکی در برآورد جریان محیط زیستی رودخانه. مجله آب و فاضلاب, 26(2), 71-81. 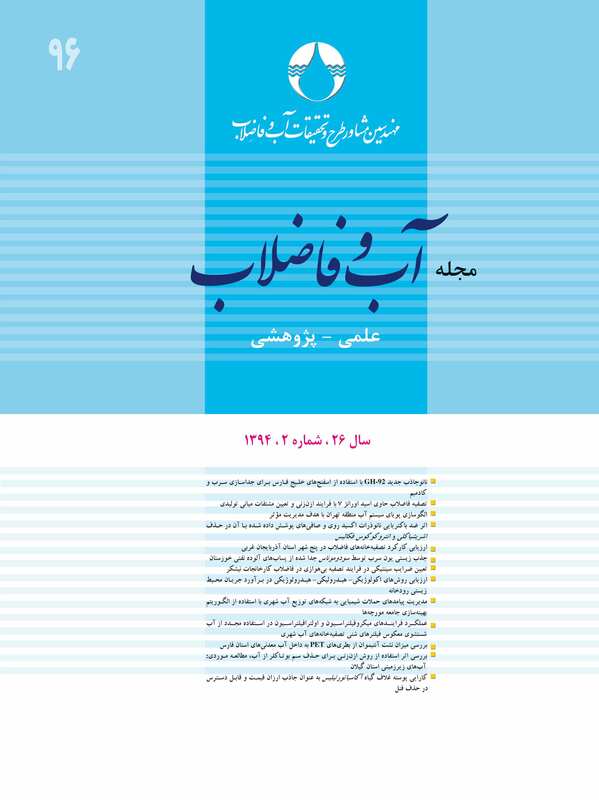 رضا عبدی; مهدی یاسی; حسین صدقی. "ارزیابی روش‌های اکولوژیکی- هیدرولیکی- هیدرولوژیکی در برآورد جریان محیط زیستی رودخانه". مجله آب و فاضلاب, 26, 2, 1394, 71-81. عبدی, رضا, یاسی, مهدی, صدقی, حسین. (1394). 'ارزیابی روش‌های اکولوژیکی- هیدرولیکی- هیدرولوژیکی در برآورد جریان محیط زیستی رودخانه', مجله آب و فاضلاب, 26(2), pp. 71-81. عبدی, رضا, یاسی, مهدی, صدقی, حسین. ارزیابی روش‌های اکولوژیکی- هیدرولیکی- هیدرولوژیکی در برآورد جریان محیط زیستی رودخانه. مجله آب و فاضلاب, 1394; 26(2): 71-81. برآورد نیاز جریان محیط زیستی در اکوسیستم‌های رودخانه‌ای در ایران کار جدیدی است. هدف اصلی در این پژوهش، ارزیابی جریان محیط زیستی به روش‌های مختلف در یک رودخانه شاخص، با جریان دائمی بود. در این بررسی، نیاز اکولوژیکی رودخانه مشترک مرزی زاب در شمال غرب ایران در سه بازه مختلف، در طول 160 کیلومتر با روش هیدرولیکی محیط خیس شده با دو الگوریتم شیب منحنی و حداکثر انحنا، همچنین با روش ترکیبی شبیه‌ساز زیستگاه و نیز روش کنترل کیفیت آب، برآورد شد. نتایج برآورد به روش‌های اکو- هیدرولیکی با نتایج شبیه روش‌های اکو- هیدرولوژیکی مقایسه شد. نتایج ارزیابی نشان داد که روش اکو- هیدرولوژیکی شامل "انتقال منحنی تداوم جریان در کلاس زیستی B (حفاظت پایدار تنوع زیستی با وجود طرح‌های توسعه منابع آب)، برای بازه بالادست (درابکای‌خانه)، گزینه مناسبی است. در این گزینه زرده ماهی به‌عنوان گونه شاخص زیستی انتخاب شد. درحالی‌که روش ترکیبی اکو- هیدرولیکی برای دو بازه میانی و پایین‌دست (گرژال و پل سردشت)، مناسب‌تر هستند. بر این اساس، دبی جریان متوسط محیط زیستی در سه بازه بالا به‌ترتیب 3/2، 6/7 و 9/7 مترمکعب بر ثانیه به‌دست آمد. توزیع ماهانه جریان محیط زیستی در هر یک از سه بازه نیز تعیین و پیشنهاد شد. The assessment of environmental flows in a river ecosystem is a new practice in Iran. The main aim of the present study was to use different Eco-hydraulic-hydrologic methods to determine the environmental flow requirements in a typical perennial river. The ecological needs of the transboundary Zab River (located in the northwest of Iran) were investigated in three different reaches along the 160 km length of the river course using the hydraulic-wetted perimeter method (and taking advantage of the two different algorithms of slope method and maximum curvature), the synthetic habitat simulation method, and the water quality control method. The results were compared with those obtained from different echo-hydrologic methods. It was found that the FDC Shifting method (considering Class B: ecologically important rivers despite water resources development) is well adapted to the conditions in the upper reaches of the river (Derabkay Khaneh). The synthetic Eco-hydraulic method is to be recommended for the middle and downstream reaches (Grezhal and Pol–Sardasht) providing the ecological requirements of the Barbus Capito fish (as the bio– indicator species) are met. The mean annual flows in the three river reaches are determined as 2.3, 7.6, and 7.9 m3/s, respectively. The potential monthly flow rates are also proposed for preserving the riverine life. Smakhtin, V.U., Revenga, C., and Doll, P. (2004). “A pilot global assessment of environmental water requirements and scarcity.” J. of Water International, 29, 307-317. Knights, P. (2002). “Environmental flows: Lessons from an Australian experience.” Proceedings of International Conference: Dialog on Water, Food and Environment, Hanoi, Vietnam. Arthington, A., Bunn, S., Poff, N., and Naiman, R. (2006). “The challenge of providing environmental flow rules tosustain river ecosystems.” J. of Ecological Applications, 16(4), 1311-1318. Gippel, C.J., and Stewardson, M.J., (1998). “Use of the wetted perimeter in defining the minimum environmental flows.” J. of Regulated Rivers: Research and Management, 14, 53-67. Poff, N., Richter, B., Arthington, A., Bunn, S., Naiman, R., Kendy, E., and Acreman, M. (2010). “The ecological limits of hydrologic alteration (ELOHA): A new framework for developing regional environmental flow standards.” J. of Freshwater Biology, 55, 147-170. 10. Shaeri Karimi, S., Yasi, M., and Eslamian, S. (2012) “Use of hydrological methods for assessment of environmental flow in a river reach.” International J. of Environmental Science and Technology, 9, 549-558. 12. Gordon, N.D., McMahon, T.A., and Finlayson, B.L. (2004). Stream hydrology: An introduction for ecologists, 2nd Ed., John Wiley and Sons, New York. 13. Suxia, L., Xingguo, M., Jun, X., Changming, L., Zhonghui, L., Baohui, M., and Lina, J. (2006) “Estimating the minimum in-stream flow requirements via wetted perimeter method based on curvature and slope techniques.” J. of Geographical Sciences, 16(2), 242-250. 14. Annear, T.C., and Conder, A.L. (1984) “Relative bias of several fisheries instream flow methods.” N. Am. J. Fish. Mgmt, 4, 531-539. 16. Roberts, J., Young, W.J., and Marston, F. (2000). Estimating the water requirements for plants of floodplain wetlands: A guide, Land and Water Resources Research and Development Corporation, Australia. 18. Code, B. (1995). Freshwater fishes of Iran, Institute of Landscape Ecology of the Academy of Sciences of the Czech Republic, Czech Republic. 19. Tchobanoglous, G., Burton, F.L., and Stensel, H.D. (1978). Wastewater engineering: Treatment disposal reuse, 2nd Ed., Metcalf and Eddy Inc., McGraw-Hill, New York. 20. Smakhtin, V.U., and Anputhas, M. (2006). An assessment of environmental flow requirements of Indian River Basins, IWMI Research Report 107. International Water Management Institute, Colombo, SriLanka. 21. Arthington, A., Rall, J., Kennrad, M., and Pusey, B. (2003) “Environmental flow requirements of fish in Lesotho rivers using the DRIFT methodology.” J. of River Res. Applic., 19, 641-666. 23. Biswas, H. (1997). Technical guidance manual for performing waste load allocations, Book II: Streams and Rivers-Part 1: Biochemical Oxygen Demand/Dissolved Oxygen and Nutrients/ Eutrophication. USEPA., USA.